No credit card, no risk sign-up 78% of new players recommend this casino 46 new players chose this casino today! Every online Casino offers something unique. And when it comes to BitStarz Casino, this is the possibility to play with lots of different cryptocurrencies like Bitcoin, Etherum, and even Dogecoin. Together with a selection of 1,800+ games. Launched in 2014, BitStarz Casino tries its best to appeal to every type of player. Did it succeed? Read this review to find out! You can find lots and lots of bonuses at BitStarz Casino. The best one is the 20 no deposit free spins for Slots. To get it, create a new account via the links you find on this page and you are all set. The free spins help you get a taste of the platform - and have lots of fun, too. After your free appetizer comes the main course. BitStarz Casino online gives you deposit bonuses on your first four deposits. You only need to deposit at least €20 each time for the extra cash and free spins to be yours. The free spins are credited for Fruit Zen and Wolf Gold. There’s never a lack of good bonuses at BitStarz online. The Casino is constantly running Slot and table game tournaments for you to compete with other players. In addition, you can claim weekly reload bonuses and free spins. The best thing is that BitStarz Casino doesn’t require any bonus codes. Everyone can enjoy all the benefits here! If you’re one of those players who like to try as many new games as possible (instead of sticking to one or two), you’ll love BitStarz Casino. That’s because they offer more than 1,800 different Casino games. And, believe me, that’s a lot. Most online gaming platforms offer a couple hundred of titles, and it’s refreshing to see a page that doesn’t shy away from variety. So, let’s take a look at the actual games of BitStarz Casino. They are divided into the following categories: Slots, Jackpots, Table Games, Live Games, and BTC Games. In the lobby, you can see the top games and the newest games of the Casino. Also, there’s a list of Slot machines recommended by the site’s staff. The list of available developers is also impressive. The Casino offers games from more than 40 software creators, and that’s the biggest variety I’ve seen so far. This list includes some of the industry giants like NetEnt, Microgaming, and Evolution Gaming, as well as some lesser-known creators like Games Warehouse, Sigma Gaming, and Lightning Box. You can try out all the games for free - no real money involved. In case you’re not sure about what you want to play - click the speech bubble with the phrase Feeling Lucky. This will open a random game for you to discover. BitStarz Casino is available in English, Swedish, Chinese, and Russian. 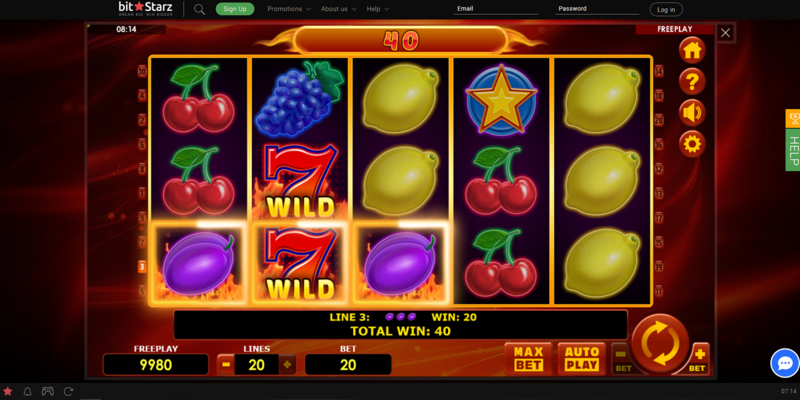 The site boasts hundreds of video Slots and Jackpots. Here you can find some of the most popular Slot machines online like Vikings Go to Hell, Tut’s Twister, and Rainbow Ryan. I’ve also come across some Slots I’ve never seen before like Vegas Magic, Sugar Skulls, and Cupid’s Strike. BitStarz Casino also has quite a few Jackpots including our beloved Mega Moolah. The site also includes a live Casino section with a lot of different versions of Blackjack, Roulette, and Baccarat. As for the games that are available to play with Bitcoin, go to the section called BTC Games. Also - at the bottom of the page, you can see some articles about the latest news on Bitcoin. It turns out that this page has it all when it comes to cryptocurrency. Like all modern online Casinos, BitStarz is available on your mobile phone. Whether you use Android or iPhone, you can access the site online and play all the games you would on the desktop version. Unfortunately, there is no BitStarz Casino app available to download. It turns out you can’t have everything! If you happen to have any questions, you can immediately contact the Casino live chat and get an answer in minutes. You see, the chat is available 24/7, so a support agent will have you covered even in the middle of the night. To access the chat, click the blue bubble at the bottom-right side of the screen. BitStarz Casino is a gaming site that combines the excitement of gambling with the possibility to play with bitcoin and other cryptocurrencies. As is features more than 1,800 games, this casino site appeals to anyone who wants to try out as many games as possible. A good mobile platform and the possibility to play with different cryptocurrencies make BitStarz Casino stand out from the crowd. There are many deposit options on BitStarz. You can choose the most convenient one for you.